Sometimes, I just have to pick up where I recently left off so I’m more sure I know where I’m going. 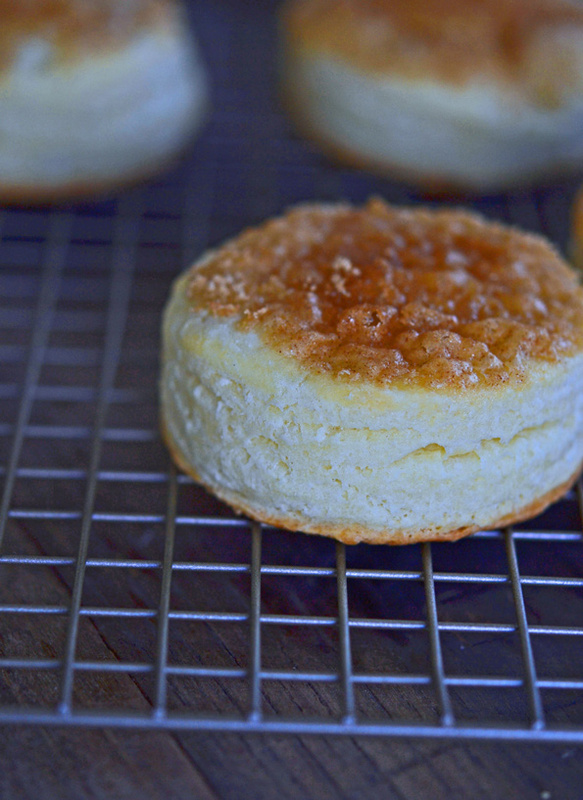 Like with these gluten free biscuits. I started with the recipe for yeast free gluten free cinnamon buns from Gluten-Free on a Shoestring Quick & Easy. I know those work really really (really) well, and that they’re delicious. And I had long suspected that, if I changed the temperature of the ingredients (cold for pastry!) and massaged the prep a bit (chopped butter instead of soft butter! ), they’d be fantastic gluten free biscuits. Sometimes, I’m not wrong. That is one. very. versatile. recipe. Cinnamon buns have not only softened butter, but eggs in the dough. Pastry (like biscuits) generally does not have eggs (like these gluten free sour cream and scallion biscuits, which have zero eggs). But I was determined to change only method and not ingredients. And they’re these super flaky (lots of layers!) but then very tender biscuits. When I’m developing new recipes (which is all the time all the time), they fail. A lot. And I don’t have time for that kind of nonsense right now! I’ve got a cookbook manuscript due at the end of the month! I’m running low on every ingredient that I thought I had in spades (75 pounds of flour in 4 weeks? Seriously?) and I’m tired of minding my manners with my family. No, I don’t want to tell you what I’m baking in case it doesn’t work out. No, that’s for the new book and I don’t want to talk about it. Since my suddenly fragile ego needed a sure thing, I did this. And it worked so beautifully that I think you should do it, too. 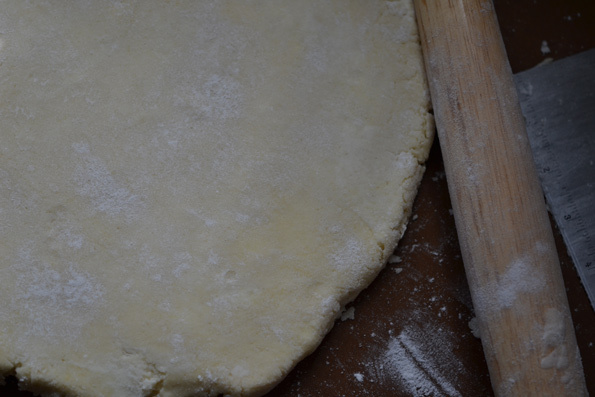 You can cut out the biscuits right after you gather together the dough in a disk, like this. But if you want flaky biscuits, you’ll need to do some rolling and folding and rolling and folding. Like we do with gluten free puff pastry, but way way quicker and easier. The cinnamon sugar that we rolled up inside the cinnamon buns gets sprinkled on top of these cold, cold biscuits. In a large bowl, place 3 1/2 cups (490 g) of the flour, the xanthan gum, baking powder, 1/4 teaspoon of the salt, and the granulated sugar, and whisk well. Add the chopped butter, and toss to coat the butter in the dry ingredients. Press each piece of butter between your thumb and forefinger and flatten it. Create a well in the center of the dry ingredients and add the eggs and milk. Mix until the dough just begins to come together. 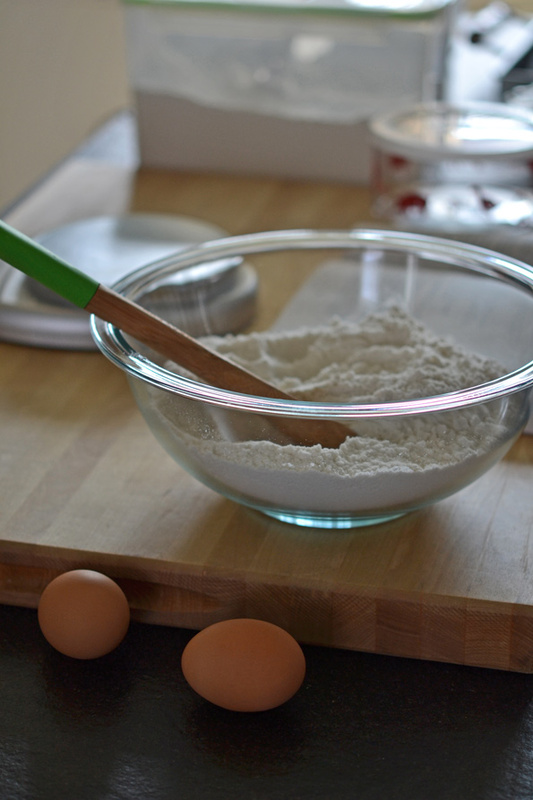 Sprinkle a flat surface with about 1/4 cup of the remaining flour, and turn the dough out onto the flour. 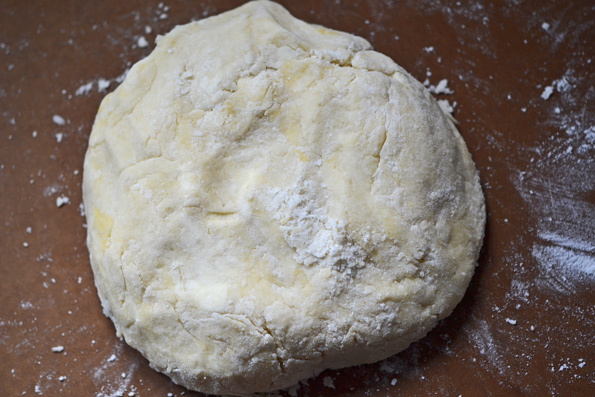 Sprinkle the top of the dough with more flour, and gather the dough and press it into a disk. For the flakiest biscuits, roll the dough into a rectangle about 3/4 inch thick, and fold it in thirds as you would a business letter. Turn the dough 1/2 turn on the counter, sprinkle with flour as necessary to prevent sticking, and roll again into a rectangle about 3/4 inch thick. 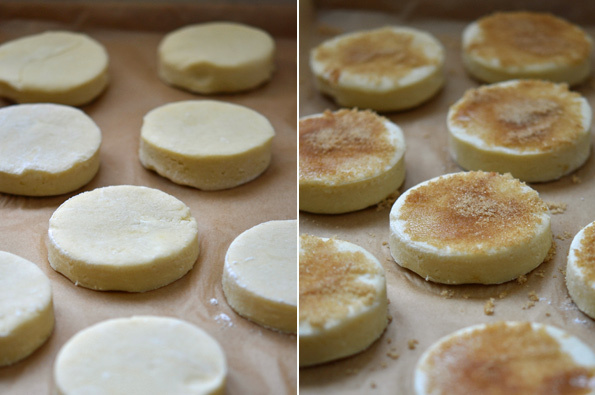 Cut out 3 inch rounds from the rectangle with a floured biscuit cutter, and place the rounds about 1 inch apart from one another on the prepared baking sheet. Gather and reroll scraps, and cut out more rounds. 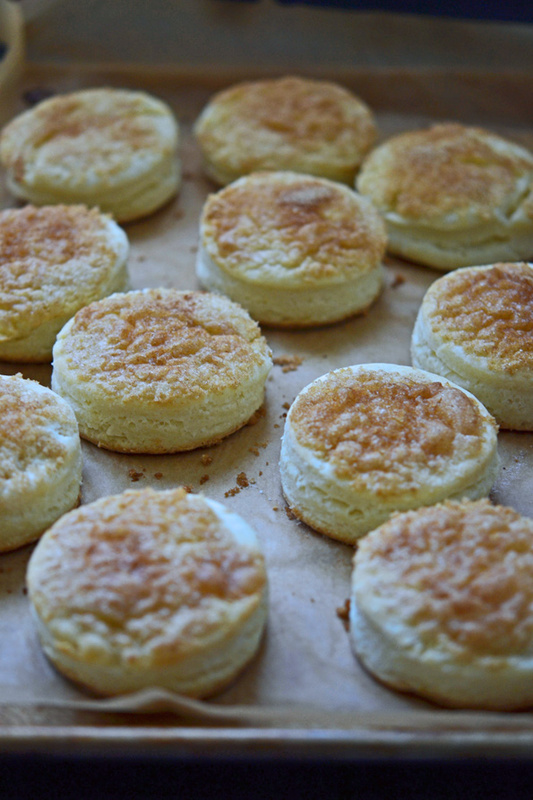 Place the baking sheet in the freezer to chill the biscuits until firm (about 10 minutes). In a small bowl, place the brown sugar and cinnamon, and mix to combine. Once the biscuits are firm, remove the baking sheet from the freezer, brush the tops of the biscuits with a bit of milk or some water, and sprinkle generously with cinnamon sugar. Place the biscuits in the center of the preheated oven and bake for about 20 minutes, or until the biscuits are puffed and lightly golden brown. Remove from the oven and allow to cool briefly before serving. P.S. To all of you who support the blog by buying My Gluten Free Cookbooks, I don’t take it for granted. You are the wind beneath my blog wings! Nicole these look so beautiful and so flaky! I wish I was the sweet eating type of biscuit girl ;) I just made the Mrs. Fields cookies and the Tres Leches cake and both were amazing! Thank you so much for all the effort you put in to write recipes that actually work :) I miss biscuits and in particular the copycat ones from Red Lobster, and I was trying to figure out if the buttermilk biscuit recipe in your first book is sans cream cheese (my husband and I both get terrible migraines from cheese)? If so I will download the kindle version right this second just for that :) thanks! And I literally cannot wait for your next book! 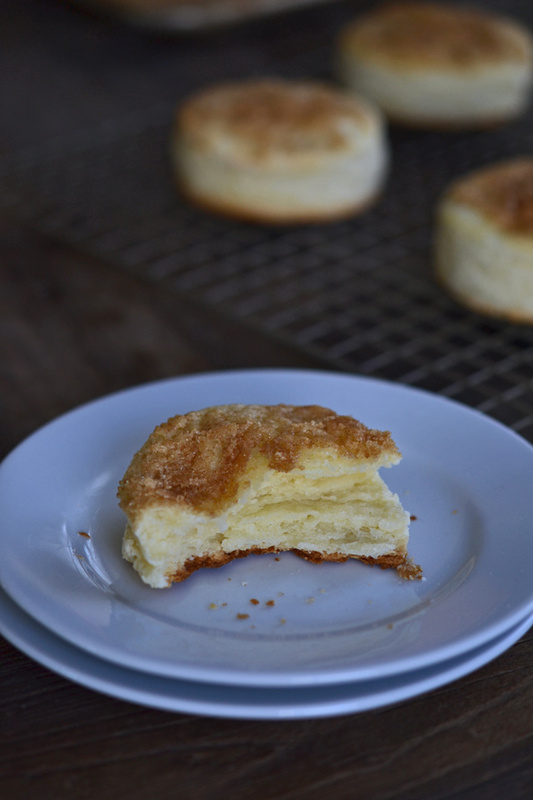 The buttermilk biscuit recipe in my first cookbook does not have any cheese. :) You should be good to go! So glad you’re enjoying all of the other recipes. You’ve already made some of my favorites! These look really good and I’m going to give them a try! And thank you for the pictures of the dough before baking. That helps me out a lot. I know your new book is way under way, but if it included more raw dough pictures- especially for the stuff you think are staples- it would be helpful to folks like me. People who maybe only started baking stuff from scratch because they need good gluten free baked goods alternatives and not because they were bakers to begin with. Outside of muffins/quick breads and cookies, I’m a baking novice. Thanks! I was just now going through the photo galleries for the photos for my bread book! There will be plenty of process photos (dough rising in a proofing basket, shaping sandwich bread, shaping rolls, shaping bagels, etc.). I think you’ll be very pleased. I fought hard to have tons of pictures throughout this next book because gluten free bread needs and deserves tons of pictures! I would suggest using my Better Than Cup4Cup All Purpose Gluten Free Flour blend (scroll down on the page). No one single gluten free flour, like brown rice flour, will ever be able to perform as an “all purpose” gluten free flour. 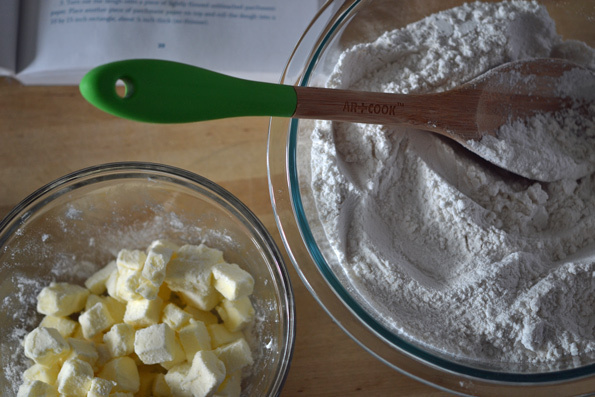 I suggest you read that whole GF Flours page on the blog! Definitely, Elaine. There isn’t a ton of sugar in the dough itself, so I think they would work great with a savory topping. I also have a recipe for gluten-free sour cream and scallion biscuits (and a few other savory biscuits) on the blog. Hi Nicole, just wondering if you think these could be frozen at that last stage and baked another day? Great question! They could most definitely be frozen on the baking sheet before sprinkling them with the cinnamon sugar, then transferred to a freezer-safe air-tight container until you are ready to bake them. On baking day, just remove them from the freezer bag, place them on a baking sheet, brush lightly with water or milk, sprinkle with cinnamon sugar and bake from frozen. You will likely need to increase the baking time a bit, but not by much (a couple minutes should do it). Perfect :) Thanks so much!! Thank you so much for taking the time to write such a kind note! I really appreciate your support and enthusiasm. Without you, this would be a very lonely business indeed. And well, no one would let me keep doing it anyway! Can’t wait for the no rye-rye and the no rye pumpernickel – used to bake most all breads for DH and need more variety. I know you will fulfill my wishes. Thanks. I LOVE both your books! So glad I found your blog and thanks for all the great ideas. Can’t wait for the next cookbook. Hey, thanks, Deborah! I’m glad you’re here – and thank you so much for your support of the cookbooks – and for your enthusiasm for Bakes Bread! Oh, I definitely want the layers. I’m sure the effort will be well worth it. I used to make this with canned biscuits for the kids now and then. I’m picturing you zipping around the kitchen with a wild look in your eye, flour on your shirt and lots of papers with mad scribbles on them. Then I’m picturing you in May, manuscript done, feet up, cold beverage, relaxing outside on a beautiful day. It will happen! And the cookbook will be fabulous! Power on, friend! I am almost embarrassed (almost) to admit how much that May image is going to help carry me through, Anneke! And oddly I’m not at embarrassed to admit that the April image is dead on accurate. To the letter. Thank you Anneke!! !